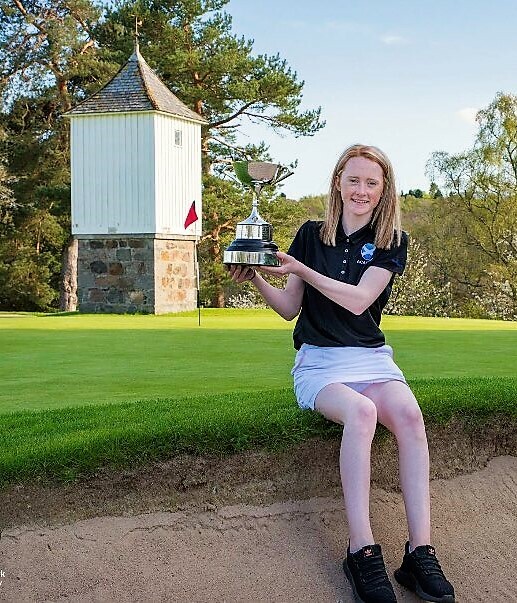 Aboyne's Carmen Griffiths became the youngest ever winner of the Aberdeenshire women's county golf championship at Banchory Golf Club today (Sunday). The 14-year-old dominated the tournament by heading the match-play qualifiers and then progressing smoothly to the final in which she beat four times former champion Sammy Leslie (Murcar Links) by 3 and 1. Griffiths had to show her fighting qualities in the final. She was three down after only four holes but had reduced her deficit to one hole at the turn. The younger player squared the match by winning the 13th and took the lead for the first time with a birdie at the 14th. Griffiths now had the upper hand. She went two up at the 15th and clinched victory with a birdie 3 at the 17th. Griffiths, born on November 23, 2003, is 14 years, five months old. The previous youngest champion was Shannon McWilliam, born on August 8, 1999, which made her 14 years nine months old when she won the title in May 2013. Griffiths bt Thom 4 and 3. Leslie bt Lees 4 and 2. FINALFinnie bt Neish 5 and 4. Left to right: Ros Dunsmuir (ALCGA President), Vikki Thom (Kemnay) (semi-finalist), Michelle Finnie (Aberdeen Ladies) (handicap champion), Carmen Griffiths (Aboyne) (champion), Sammy Leslie (Murcar Links) (runner-up) and Ann Smart (ALCGA captain). Picture and captain by ALCGA secretary Karen Stalker.